Caption slip reads: “Photographer: Olmo. Date: 1954-12-21. Reporter: Sid Bernstein. Assignment: Before Christmas at Ann St. Animal Shelter and SPCA Shelter. 19: Young pups available at SPCA group behind wire. 20: Smooth hair terrier, six weeks old, at SPCA. 23/26: Sad and lively team at SPCA, smooth terrier and black and white mixed breed. 21/22/24: At Ann St. Animal Shelter pair of mixed Samoyede, found in East Los Angeles, 8 weeks old, and tiny mixed brown pup. 28/29/30/31/32: Same with one of new kittens available. (this is off season for cats.) 33/34/35/36: Mixed brown pup. 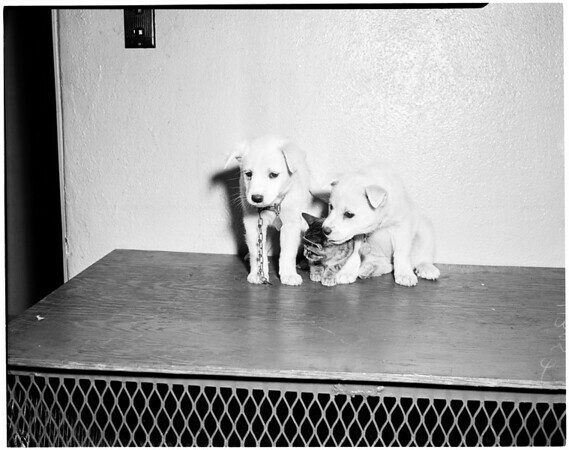 at Ann St. 37/38: Samoyede pups at Ann St Animal Shelter. (Hold for Riblett)”.